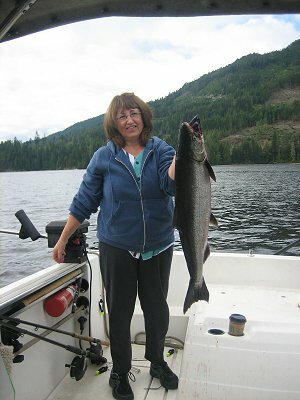 12th October 2012: FISHING REPORT: Port Alberni Inlet, Barkley Sound, Ucluelet (West Coast), Somas-Stamp River System. The fall summer like weather has continued in much of British Columbia. Most Vancouver Island areas have been experiencing warm wonderful days with day time temperatures ranging between twenty to twenty-five degrees celsius. The Thanksgiving weekend saw Port Alberni at 27 degrees on one day during the three day weekend which often marks the end of summer camping and Saltwater angling. 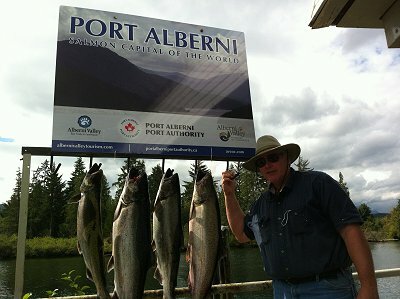 The 2012 summer sport fishing season has come to an end for most saltwater locations in British Columbia. Chum fishing is often a hit in a few areas. Browns Bay close to Campbell River is experiencing a good return of Chum salmon and is one area where sport fishing has continued with excellent results. We can only look forward to the 2013 saltwater fishing season which many anglers are forecasting and/or predicting to be very good in most Pacific Rim areas. Ocean conditions have been very good for stocks returning next spring and summer. Mortality rates have been low and food for salmon stocks out in the North Pacific Ocean have been fairly abundant. This is often a great indicator for the next year. Pacific salmon stocks returning to Pacific Rim rivers, creeks, and streams is well under way. The salmon are wanting to quickly move to their spawning grounds but there has been a general lack of water in most of the area. The region is suprisingly experiencing drought like conditions with little percipitation since early in the summer. It is hoped that the forecast for rain in the next few days occurs. Chinook and Coho returning to the Somass-Stamp system for example have not been totally haulted but rain will bring in the many fish holding in the inlet and Somass River mouth. Rain finally is in the long term weather pattern with heavy rain forecast to hit the Pacific Coast during the weekend of October 13th. This should help the migration of the salmon not only in the Stamp but also the many other systems in this area and the rest of British Columbia especially those areas in the Pacific North West. Fresh salmon are however entering the Somass-Stamp River system daily (even with low water). Over the last five or six days the mornings and late evenings have had a good push of bright silver Coho. With rain in the immediate weather pattern there should be a large migration of salmon in all of the river systems. The Stamp River is one of British Columbia’s premier fishing rivers. There is an opportunity to fish almost twelve months of the year. Sockeye salmon begin in May and continue into August. Usually the last week of August the Stamp River will open for Chinook and Coho stocks which continue into November. The Summer, Fall, and Winter Steelhead fishing occurs from July, for Summer Steelhead, right through until late April. The Winter Steelhead season usually begins in mid December. The Stamp River is divided into three sections. The Upper River is above Stamp Falls. The Mid River is below the falls and above “the bucket”. The Lower River is below “the bucket”. Usually by this time of year most of the salmon except for Chum have moved from the Lower River to the Upper portion. With the current dry weather pattern only sixty to seventy percent of the Chinook and possibly half of the total expected Coho have pushed through into the Upper Stamp. To Date approximately 11,000 to 12,000 Chinook have gone through the fishway counters and 21,000 to 22,000 Coho salmon have passed through. Many of the Chinook and Coho are hatchery fish and will make their way to Robertson Creek Hatchery. The Hatchery needs approximately 2,000 females to obtain an egg count of fifty-seven million. There is also a natural spawn of Chinook and Coho on the river. It is expected that if heavy rain occurs the river will fill with much needed water and many new fish will quickly move to the hatchery and upper river. The current conditions on the Stamp are not that favorable for salmon migration. The water is at the lowest level in twenty-five years. The water temperature in the afternoons is about fifteen or sixteen degrees celsius. The salmon however have not been impeded and are making their way slowly to their “final destination”. For many guides and guests the fishing in the Lower River over the past ten to fourteen days has been quite good. 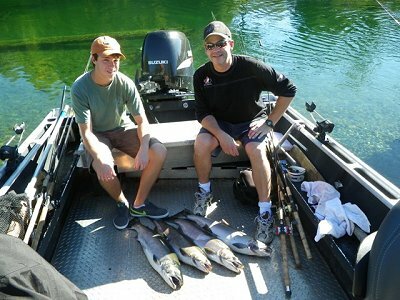 Guests have been hooking into many Coho and have been landing limits aboard jet boats. 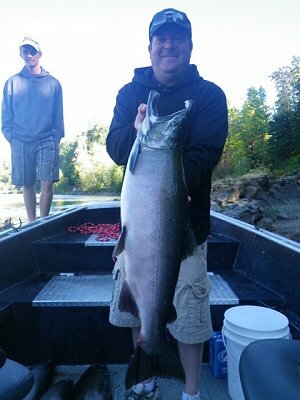 Most of the Coho are averaging eight to eleven pounds and are quite bright. The Chinook have been hanging around in the system a little longer but there still are a few bright Chinook in the mix. With low water conditions the best lures have been what one would call “hardware”. In the lower and upper river the Coho have been hitting kitimats, crocodiles, and the Gibbs Coho spoon---has been a very good lure. Of course in the lower river roe or roe bags have both been doing very well. Bait is allowed to be used in the lower portion of the river below “the bucket” ONLY. With low water and a natural spawn taking place this time of year could be called fly fishermens haven for those fishing especially for Fall Steelhead which are also in good numbers especially in the Upper River. The conditions are pretty much perfect for those avid fly fishermen. The Steelhead are becoming very lively with the loose eggs that are floating. The once sedentary Steelhead are now becoming very active and are not only hitting flies for those avid fly fishermen but also gooey bobs, white, pink, orange, and combination colors of wool for conventional anglers. Those not using a guide or boat the walking access is favorable for those fishing conventionally or fly fishing. There is a lot of private property and using these spots is not allowed. One can enter the river at the rifle range or use Service Road and walk the river down to Dolans Pit. The Slide Pool and Eagle Rock are both excellent spots as is Stamp Falls Park, Black Rock, and Moneys Pool. If the weather does change and the area experiences a healthy amount of rainfall the fish will make a very quick push to the Upper River. The salmon one might say are very tempermental and want to spawn either at the hatchery or naturally in the system. With rain definitely on the way anglers and guides with guests will begin to concentrate fishing the Upper River. If the water rises guiedes with more than likely switch to colorados and continue using gooey bobs and spin glows. Fly fishermen should continue with some great fishing on the fly into the Remembrance Day Weekend. Fishing in the Alberni Inlet is all but over even though there is a substantial number of Coho waiting in the Harbor-Inlet area for rain to help them easily move to their spawning grounds. We are expecting next years Sockeye fishery to begin by mid June or earlier. This years Sockeye returns were slightly less than predicted with just over 825,000 Sockeye returning to either Sproat Lake or Great Central Lake. Final Chinook and Coho returns will not be known until later in November. Sockeye fishing is a fantastic family fishery and most years begins in mid June through to the beginning of August. Barkley Sound has had some wonderful days on the water over the last few weeks but the fishing has been slow. There have been a few big straggling Coho along the surf line and also the Bamfield Wall, Sarita Bay and Fleming Island. The last weekend of September and the first day or two of October we had two boats fishing Meares and Austin Island where eight nice Feeder Chinook weighing up to fourteen pounds were landed by guests from Saskatchewan. These fish were deep close to Austin Island and were hitting Anchovy behind a Rhys Davis chartreuse or halloween teaser head. Leader lengths were six feet behind a green or chartreuse glow hotspot flasher. Three Coho all weighing fifteen pounds were also landed. The Coho in the sound have been hitting white and green hootchies and also a halloween hootchie and several four inch coyote spoons. We are expecting some reasonable feeder Chinook fishing to occur in the Sound during October if sufficient amounts of bait move in. There are some good sized schools of feeders just offshore and if the sound has bait these salmon will move in to feed. Good Winter or feeder Chinook fishing usually occurs from late February into May in Barkley Sound. Next summer should once again see some excellent Chinook and Coho fishing. The summer of 2012 had the best fishing in June, July, and the first part of August. Every year is different and obviously we will see what next year brings. There have been some fantasitc days out on British Columbia’s extreme West Coast. The weather has created brilliant sunshine and warm afternoons with flat water. The various banks have produced some nice Feeder Chinook weighing six to ten pounds. There have also been a few late Coho that have been eight to fifteen pounds. The Turtle Head, Jenna Reef, Lighthouse Bank and a few areas close to the Harbour have been fairly decent. The Chinook have been close to the bottom as they are feeding on needlefish. Coyote spoons in the 3.5 inch size and needlefish hootchies have been the best lures. Ucluelet is one area on B.C.’s rugged coastline that anglers have opportunity to land a twenty pound salmon twelve months of the year. 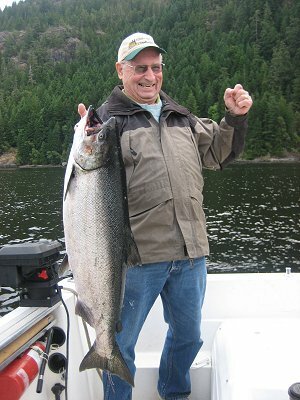 Naturally when weather patterns change during the late fall and winter months it can be very difficult to get out on the open water but there are some wonderful days between weather systems and many anglers take advantage of this and have some wonderful opportunities fishing salmon on the coast. Over the past month a few charter boats from the Bamfield area and Ucluelet have been taking advantage of the warm water current and beautiful flat water and have been going out to the Barkley Canyon which is fifty nautical miles offshore to fish Tuna. There have been some excellent results with many limits of tuna averaging twenty-two pounds. As the weather changes in the fall this will be a difficult fishery for sport anglers.